There is little doubt in my mind that Pablo D’Stair works hard. He puts out films at a rapid rate and each one has a very different focus and theme. The problem is that they all suffer from the same crippling afflictions; the group of actors which he uses cannot generate empathy or interest in the viewer, Pablo’s scripts are so dense with conversational mumble that the few gems of dialogue get completely lost within the mess and each film is so overladen with that dialogue and poor acting that it produces an unfortunate soporific effect. Pablo gets all of my praise for continuing to battle on despite very conflicted reviews, but I’m sad to say that this is his worst yet. 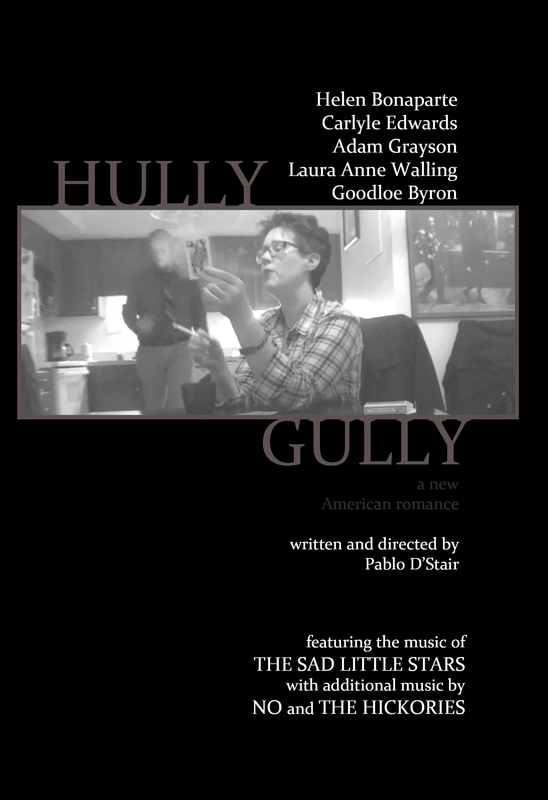 Hully Gully highlights those common flaws which unite his work even more succinctly than his past two films (A Public Ransom, Doctor, Lawyer, Indian Chief) because, unlike those which have an interesting central plot idea on which the never ending dialogue can be hung, this has no plot. Despite how the ideas were ultimately executed, his past two films dealt with men who had to try to find the truth in crazy situations, who had their morality tested and at times their sanity was even arguably called into question. This time around we are given what Pablo has termed ‘a new American romance’ in which a couple sit and mumble through their cigarettes at each other. Sometimes they say something rooted in philosophy, sometimes they just pass the time of day… often the sound mix is so poor that their mumbles are completely incomprehensible. The other big problem with Hully Gully is the actors. Now D’Stair’s script is largely to blame as I think even Peter O’Toole would struggle to make these words come to life, but that doesn’t entirely excuse the work we see from these guys. Just like in his past films actress Helen Bonaparte is the stronger of the two leads and Carlyle Edwards seems set on a mission to make the experience as unbearable as humanly possible. I’ll give him credit, he doesn’t overact as obviously as he did before. In D’Stair’s previous works Edwards flails around on the screen like a child who has seen one play and then has been asked to recite Shakespeare. He has no dramatic control or sense of timing and here he employs a cockney accent which is so god awful that I just wanted to run a mile screaming. In case you haven’t guessed, I don’t recommend this film. Pablo D’Stair is a decent, hardworking guy who needs to stop running before he can walk. If he can slow down and take a good long look at his past work he may start creating films which feel alive and full of energy, where his dialogue can sparkle and where his actors give controlled and measured performances. The guy has passion and some level of talent too so perhaps we will see a D’Stair film like that one day, but we have rather a long way to go until then. What is the film’s greatest strength? Perhaps the soundtrack? It’s interesting but does bleed into the dialogue too much. Its greatest weakness? I’m going to say it was Edwards. Would I see it again? No. Thanks for reading, please do let loose in the comment box below! Thank you Pablo for being such a fantastically good sport about this. It takes a lot to make a movie and put it out there, let along to send it to critics you know are unlikely to receive it well! Oh, you always receive it perfect (enjoy it…that’s another thing, haha) that’s why I let myself in for what odds are is coming, every time 🙂 You’re a champ, James. I haven’t been able to see this one yet because they cut off my wi-fi where I watch most of movies, so I can’t stream it….. sounds tough…. Yeah… you know what to expect from Pablo . It’s a tough gig to get through for sure.